Thousands more Britons are homeless and not represented on official government records, a new study has suggested, with a rise of nearly 10 percent between 2013 and 2014. The report, produced by the homeless charity Crisis and the Joseph Rowntree Foundation, suggests the number of “hidden homeless” – people who are not officially classified as homeless by official standards – increased by around 280,000 last year, due to “informal” methods conducted by councils to tackle poverty. The techniques included forcing families to move out of boroughs to find affordable housing, and not accounting for those evicted from privately rented accommodation. The report also suggests benefit cuts, particularly for low wage earners, meant that many were being forced to live in rough conditions or move to another area. Additionally, the report factors in families deemed at risk of being made homeless, estimating around 280,000 families had to receive some sort of assistance or debt relief from the council to avoid being evicted from their homes. 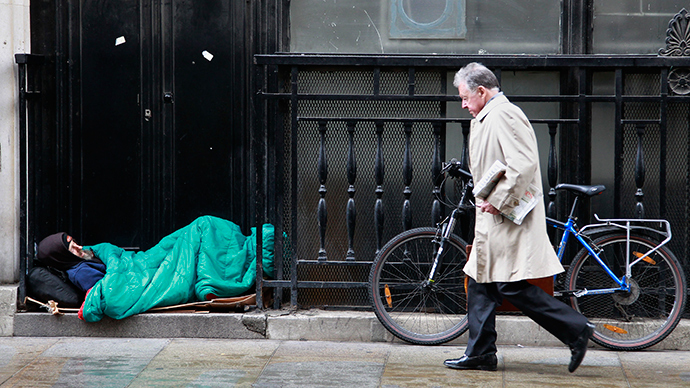 “We see that the number of cases of people facing or at serious risk of homelessness rose sharply last year,” said Dr Suzanne Fitzpatrick, the lead author of the report. The report is the product of an independent study of England’s 326 local councils, and challenges the official government line that homelessness in the UK is falling. According to official government figures, there were 52,000 cases of “accepted homelessness” last year – a decline of around 3 percent compared with 2012-13. “Council officials are clear that benefit cuts and sanctions are taking a dreadful toll on people's lives, with rising numbers facing the loss of their home at a time when councils are being forced to cut services. This is a desperate state of affairs,” he added. Additionally, the report shows welfare reforms such as the bedroom tax and cuts to jobseeker’s allowances mean homelessness is increasing at an even higher rate – while predicting the reforms will negatively impact vulnerable households for the next two years. “This government has increased spending to prevent homelessness and rough sleeping, making over £500 million available to local authorities and the voluntary sector,” said housing minister Kris Hopkins. The Joseph Rowntree foundation also warned of the psychological impacts of homelessness in Britain, stressing the importance of providing safe spaces for those evicted. “Homelessness can be catastrophic for those of us who experience it,” said the organization’s chief executive Julia Unwin. “If we are to prevent a deepening crisis, we must look to secure alternatives to home ownership for those who cannot afford to buy – longer term, secure accommodation at prices that those on the lowest incomes can afford,” she added.